For this year's #Diversiverse event, I had several choices of books from authors of color. 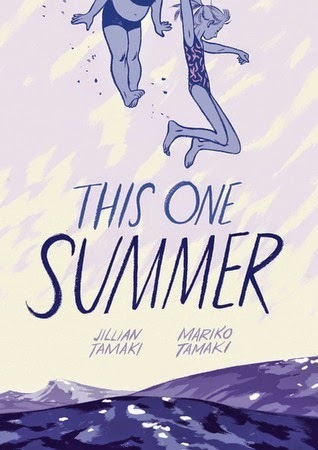 I chose to dive into one of the graphic novels on my stacks, This One Summer, by Japanese- and Jewish-Canadian author cousins, Jillian and Mariko Tamaki. On the surface, this might seem an odd graphic novel to choose for #Diversiverse. The main characters are both white, for instance, but does that mean diverse authors can't write about them? Certainly not. One of the most important things, to me, about reading diversely, is reading about diverse experiences and to see what authors of diverse backgrounds include in their work, thematically, that resonates with me. That can resonate with all of us! In This One Summer, Rose goes to Awago Beach for a lake house vacation with her parents just like all the years before. She's excited to see her friend Windy who is always there, too. But this one summer, Rose's parents won't stop fighting, her mom has a hard time getting out of bed each day, and even a visit from her spirited aunt and uncle can't make things right. Windy and Rose escape the tension at home by observing the local teens and their dramas, watching horror movies that are way too mature for them, and generally trying to navigate their emotional growing pains. It's hard to pinpoint why I loved this graphic novel so much. It's just a lovely examination of growing up. It's also a good look at Othering, no matter what background you're from. Rose and Windy certainly feel Othered in their own ways. Rose is alienated from her parents, Windy is alienated by the fact that she's adopted, and both girls are alienated in the face of some crass locals and their personal dramas. Along with that Othering comes a profound sense of loneliness for each of the characters for their own very personal reasons. Ultimately this is an examination of universal themes that everyone can relate to. The written story is fantastic, and the artwork is just as effective. Drawn in dark purple, black, and navy blue, it's a moody atmosphere with dramatic contrasts and shading. It reflects all of the nuances in these girls' lives so wonderfully and creates a perfectly put-together reading experience. Now I can't wait to read their other graphic novel, Skim! Thanks so much to Aarti for hosting this fantastic #Diversiverse event! Click to read reviews and link up your own! 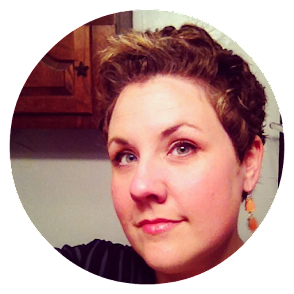 I've been a bit behind on the blogging lately and hadn't heard of this Diversiverse thing before but I love the idea and the thinking that it is generating. I haven't read this particular graphic novel but now I really want to. I love the themes that you mention and the ways in which it approaches very real struggles. I also find myself constantly challenging to read more diverse works to get that greater perspective on how others live to try and create more empathy in myself! I feel like I could read and talk for ages about this as I was a social justice nut in college and find I've distanced myself from a lot of the issues that lit my fire back then. I guess that getting a job and dealing with the every day hum drum of my grown up light gave me distance from some of those issues. But I don't want to forget about them. I want to constantly keep up with this stuff in the hopes of lighting fires in the hearts of my students. I really loved the way the bodies were drawn in this one. It was great to see women, teens and tweens of all sizes and shapes that just looked natural and real. After an underwhelming experience I had sworn off graphic novels as not for me but this review and a few I've seen of Relish make me want to break that! I'll definitely be on the lookout for this one. It sounds like an interesting read. This sounds sooo good. I love the cover! I feel a little silly but... I hadn't heard of "Othering" until you mentioned it in this post. But I googled it, and wow. What an added layer of depth that gives to the development of these characters. Loved reading your thoughts on this one. I don't read many graphic novels, but this truly sounds wonderful. LOVE the cover! I loved this one too and just in general love everything that Jillian and Mariko do. This one resonated with me so much! SKIM is so great. I liked it even more, though the summer cottage feeling of this one is great and makes me nostalgic. I'll be talking about both books on a podcast called WriteReads soon. I think it will be aired at the end of October. I'll let you know. I'm going to put this on my "list of graphic novels to buy for the readathon" list :D I really really love the idea of having a book around that represents all sorts of body shapes. As a woman (and the mom of two girls!) it's crazy important to have those around. Thanks! "One of the most important things, to me, about reading diversely, is reading about diverse experiences and to see what authors of diverse backgrounds include in their work, thematically, that resonates with me. That can resonate with all of us!" It's funny because I was having a comment chat with another Diversiverse participant who said she was surprised that the book she read for the event did NOT focus a lot on the main character's race. I think that NOW, it's maybe easier to write a book as a POC that features a POC character. But would be great if they could write books about POC characters, and we don't all expect race to be a prominent part of the book, and we may be a little bit away from that still.